Israel's Netanyahu Embraces European Leaders With Controversial Views On Holocaust Prime Minister Benjamin Netanyahu has befriended nationalist and far-right leaders who tend to be staunchly pro-Israel. But some Israelis say he's too lenient about their views on Holocaust history. 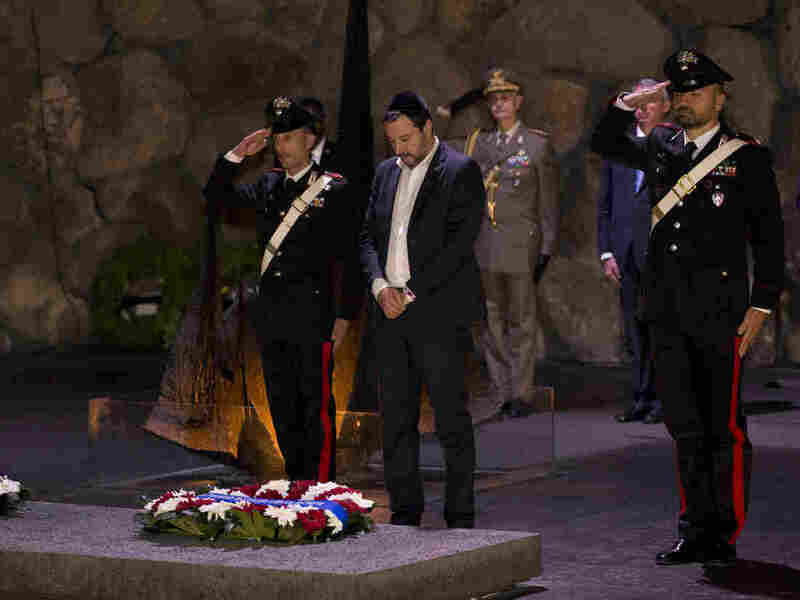 Italian Interior Minister Matteo Salvini attends a memorial ceremony at Yad Vashem in Jerusalem last week. Last week, Israel welcomed the leader of Italy's far right, Interior Minister Matteo Salvini. Called a neo-fascist by his left-wing critics, Salvini was accused of embracing World War II-era dictator and Hitler ally Benito Mussolini when he echoed Mussolini's words in a tweet marking the anniversary of his birth. Netanyahu last Wednesday called Salvini "a great friend of Israel." Netanyahu has also forged alliances with nationalist leaders in Hungary and Poland, whose governments have been accused of playing down — in contradiction of the historical record — the role their nations played in the genocide of Jews during World War II. Hungarian Prime Minister Viktor Orbán shakes hands with Israeli Prime Minister Benjamin Netanyahu in July during a joint press conference in Jerusalem. 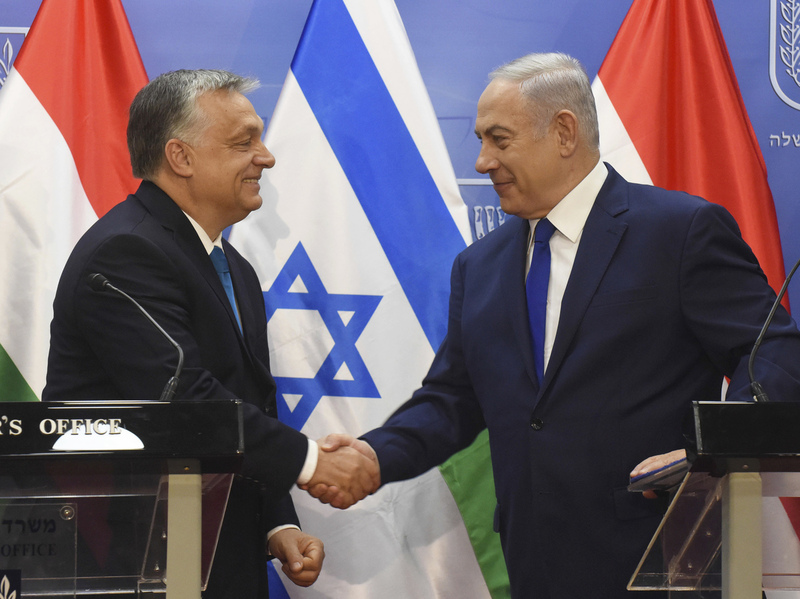 Hungarian Prime Minister Victor Orbán, who visited Israel this summer, has called his country's World War II-era leader Miklós Horthy an "exceptional statesman." Horthy's "government was anti-Semitic" and enacted anti-Jewish legislation, according to Israel's Holocaust memorial. Polish Prime Minister Mateusz Morawiecki has supported legislation to crack down on claims that Poland was complicit in the Holocaust. "Those who say that Poland may be responsible for the crimes of World War II deserve jail terms," Morawiecki told Polish lawmakers in June. Liberal Israeli lawmakers and some academic specialists on the Holocaust have voiced alarm at the red-carpet treatment these leaders have received in Israel. Some staffers at Yad Vashem, Israel's Holocaust memorial, are torn about having to play host during the leaders' visits to the memorial. "People at Yad Vashem don't like these visits. But they are committed to them because Yad Vashem is an open place," historian Yehuda Bauer, academic adviser to Yad Vashem and honorary chairman of the International Holocaust Remembrance Alliance, told NPR. Conservative analysts in Israel back Netanyahu's embrace of the nationalist European leaders, despite their rhetoric and policies at home, because they say these leaders are more staunchly pro-Israel than others in Europe. "No country in the world would sacrifice its national interest for the sake of moral values," Israeli analyst Emmanuel Navon wrote last week in the Times of Israel. "Expecting Israel (and only Israel) to do so is absurd." Last week, Netanyahu offered a peek into his alliances with new far-right leaders who promote controversial policies at home. In response to a reporter's question about the conservative wave sweeping Latin America and his embrace of Brazil's far-right President-elect Jair Bolsonaro, Netanyahu said, "Our concern is not the domestic decisions, the political decisions, but what is their relationship to us?" One controversy has to do with Hungary's recent announcement to move forward with the House of Fates, a planned Holocaust museum in Budapest that has been stalled for years over criticism that the exhibit would whitewash Hungary's role in the Holocaust. Yad Vashem disassociated itself with the Budapest museum project, saying the planned museum would ignore "the crucial role played by Hungarian authorities and a great many individual Hungarians in the persecution and deportation of Jews." But last week, Netanyahu's office said it met with visiting Hungarian government officials in efforts to reach a "desired consensus" on the museum's content. "The realpolitik is apparently is more important than the memory of the Holocaust," said Bauer, a critic of Netanyahu. "I think the attitudes of the Israeli government are extremely problematic." Bauer said Yad Vashem staff also met with the Hungarian officials. Yad Vashem declined comment. This summer, Netanyahu was criticized after he reached a deal with Poland to repeal parts of a controversial Polish law against Holocaust speech. Yad Vashem said the revised legislation did not go far enough in protecting historians from publishing about Polish complicity in the Holocaust. The memorial criticized an official Israeli-Polish statement for containing "grave errors and deceptions" about Poland's role in the Holocaust. Netanyahu's embrace of these leaders is part of his larger political strategy to embolden a pro-Israel counterweight inside the European Union, said Alon Liel, a former senior Israeli diplomat. Such alliances began around 2010, as Israel's relations with Turkey became rocky and Israel turned to countries like Cyprus, Greece and Romania for joint military exercises, Liel said. With Islamist attacks in Europe and rising anti-Muslim sentiment, right-wing figures in eastern Europe grew closer to Israel, admiring its nationalism, stance against Islamism and economic successes. Now the European Union, which has long championed a Palestinian state and condemned Israel for its policies in the occupied West Bank, no longer speaks with a unified voice. "This was played up with a lot of diplomatic talent, especially by Netanyahu. You don't have one view inside Europe considering the Israeli-Palestinian conflict. You have two views," Liel said. Dore Gold, who previously served as director general of Israel's foreign ministry under Netanyahu, and continues to advise Netanyahu, said it was unfair to single out Eastern European leaders, referencing British Labour leader Jeremy Corbyn's controversial appearance at a conference six years ago with a Hamas militant convicted for attacks. Last week, a European Union survey of European Jews found they believe there is a rise in anti-Semitism in the 12 EU member states that are home to most of Europe's Jews. Most are in western Europe. In France, 95 percent of respondents said anti-Semitism was a "big" or "fairly big" problem. "To say eastern Europe has a monopoly on anti-Jewish expressions is wrong. It's coming out of western Europe too. In these eastern European cases, there is no anti-Israel tone and there is little thirst to support Middle Eastern terrorist organizations," Gold said.